In the same way that I love cookbooks with a narrative — more memoir than instructional manual — I found reading The Chinese Way to Wealth and Prosperity pleasurable in that I learned much about the culture of my own people. The author is my brother, Michael Lee, and he sent me an early copy. The fact that we grew up together does not preclude our separate areas of experiences, with him being an expert in finance, a world traveler, and a former student of martial arts. This book is clearly and concisely written with the lay reader in mind. Speaking as an elder sister, I’m finally realizing that there is much I can learn from my baby brother. In our economy, who would want to learn about getting rich slowly? 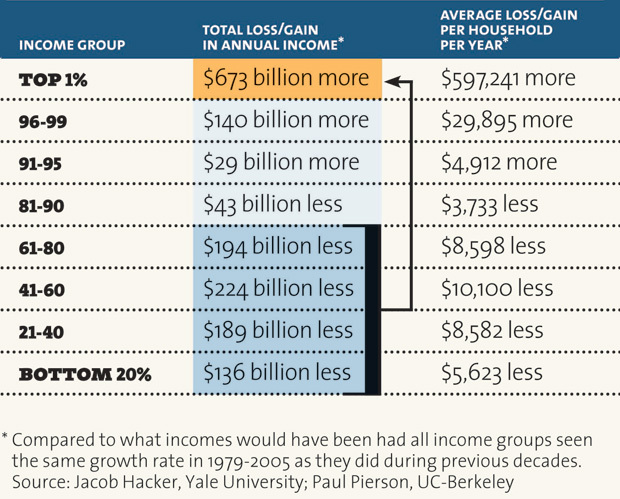 However, the financial crisis of this country is mostly attributable to the “get-rich-quick” mindset of many Americans. Here’s Michael’s remedy for this malaise: utilize the human capital that is in each and every one of us and apply his eight time-tested strategies for achieving financial success. There are no short cuts and you have to learn to defer gratification. Being a preacher, Conwell must have been familiar with the Bible, but I wonder if he knew about the parable that Jews tell about the Jew from Lublin who dreams of a treasure near the Imperial Palace in Prague and journeys to seek it. He meets a soldier there who tells of his own dream of treasure under a humble Jew’s floor in Lublin and scoffed at his likelihood of success, whereupon the Jew returns home, digs under his floorboards, and unearths his treasure. The point of both stories is to draw upon our inner resources, our innate human capital. 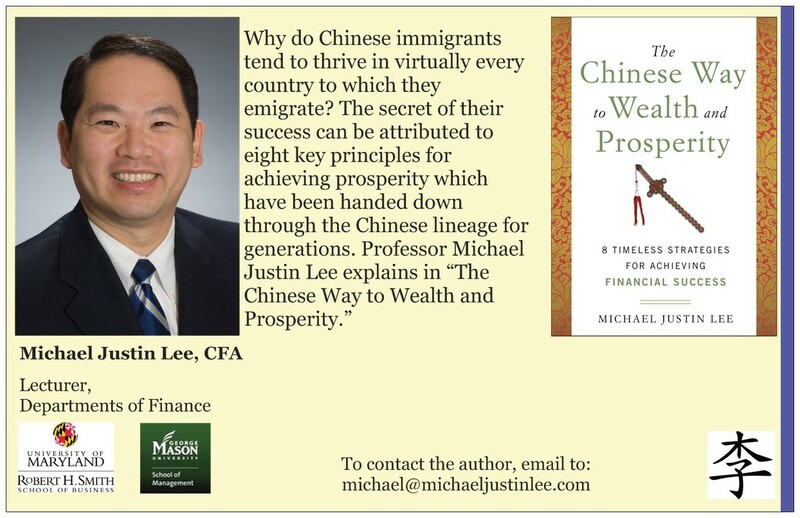 Michael wrote this book to show others that they too can apply these culturally based principles that have served the Chinese so well, both in their homeland as in the diaspora. One illustrative chapter is the one on “Obtain “Kung Fu” in Education,” in which Michael extolls the Chinese value of education. In January 2011, Amy Chua published a provocative piece in the Wall Street Journal, “Why Chinese Mothers are Superior,” (giving advance guard to her book, Battle Hymn of the Tiger Mother ) and sparked a public debate about parenting styles. Around the same time, an international study was also published, which is of far greater significance. The OECD, the Organization for Economic Cooperation and Development, a major nongovernment institution based in Paris, released the latest results in its influential Programme for International Student Assessment study. This triennial study assessed the reading, science, and math skills of 15-year-olds from public schools in all 34 OECD member states, as well as in a host of other nations. The results were not encouraging for U.S. taxpayers and must have been very disappointing for the U.S. Department of Education. That’s because in these OECD rankings, the United States, the world’s most economically dynamic and prosperous country by far, could rank no higher than thirty-first in the world in mathematics. This dismal showing for American mathematical skills has by now become repetitious and expected. But to me, there was a slightly surprising outcome in the science rankings, in which the United States finished twenty-third. Imagine, the powerful United States, home to the mightly MIT and Cal Tech, ranked essentially in the high minor leagues in the science scorecard. The earth-shattering moment occurred to me when I read: “the main reason why education holds the esteemed position it does in the Chinese and Confucian societies is that education provides the very and sole means of becoming fully human. Education for its own sake just doesn’t cut it.” Equally compelling for me was when Michael calls for a return to civic education, for building an institutional movement toward the creation of “good” people. I cannot give away the secrets of this tightly constructed book, so I urge you to get your own copy. You’ll learn some crucial principles for financial health and you’ll have a ball learning about the Chinese people and its culture. This is the last of a seven part series of 11 charts by Dave Gilson and Carolyn Perot courtesy of Mother Jones. We will be reprinting a selection every 24 hours this week. For more cutting edge journalism from Mother Jones, please sign up for their free newsletter at motherjones. This is the sixth of a series of 11 charts by Dave Gilson and Carolyn Perot courtesy of Mother Jones. We will be reprinting a selection every 24 hours this week. For more cutting edge journalism from Mother Jones, please sign up for their free newsletter at motherjones. This is the fifth of a series of 11 charts by Dave Gilson and Carolyn Perot courtesy of Mother Jones. We will be reprinting a selection every 24 hours this week. For more cutting edge journalism from Mother Jones, please sign up for their free newsletter at motherjones. This is the fourth of a series of 11 charts by Dave Gilson and Carolyn Perot courtesy of Mother Jones. We will be reprinting a selection every 24 hours this week. For more cutting edge journalism from Mother Jones, please sign up for their free newsletter at motherjones.com/newsletter. A Harvard business professor and a behavioral economist recently asked more than 5,000 Americans how they thought wealth is distributed in the United States. Most thought that it’s more balanced than it actually is. Asked to choose their ideal distribution of wealth, 92% picked one that was even more equitable. This is the third of a series of 11 charts by Dave Gilson and Carolyn Perot courtesy of Mother Jones. We will be reprinting a selection every 24 hours this week. For more cutting edge journalism from Mother Jones, please sign up for their free newsletter at motherjones.com/newsletter. 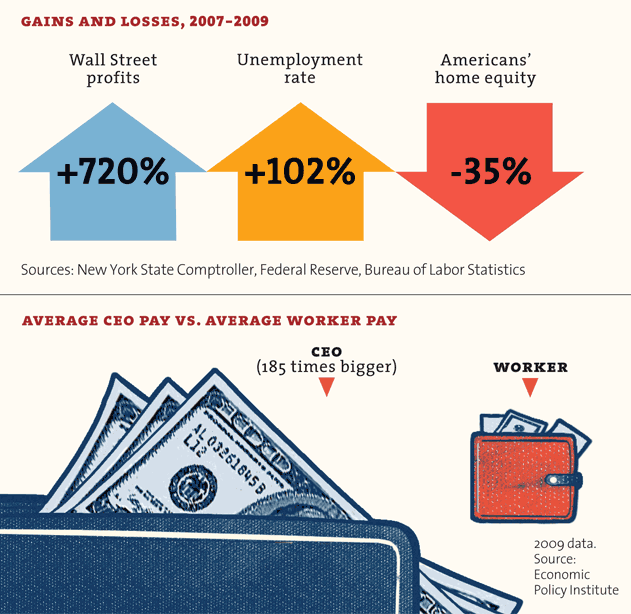 This is the second of a series of 11 charts by Dave Gilson and Carolyn Perot courtesy of Mother Jones. We will be reprinting a selection every 24 hours this week. For more cutting edge journalism from Mother Jones, please sign up for their free newsletter at motherjones.com/newsletter. This is the first of a series of 11 charts by Dave Gilson and Carolyn Perot courtesy of Mother Jones. We will be reprinting a selection every 24 hours this week. For more cutting edge journalism from Mother Jones, please sign up for their free newsletter at motherjones.com/newsletter.